Yesterday seven volunteers gathered in DKH Wood to do some Spring cleaning. We finally tackled the long-overdue task of weeding the hedge that runs along the North side. This had been planted a couple of years ago and some of the whips had grown very tall rather than sprouting into a hedge. When growing a hedge it’s important to cut the whips regularly so that they shoot sideways and become thicker rather than growing into tall single trees. The problem we had was that there was so much cow parsely, bramble and nettle growing around the hedge that it was impossible to even find the hedging plants. We managed to get in behind the temporary chestnut fencing to reach the hedge and cut back all of the weeds. It turns out that the hedging plants were still there but had been so smothered that many of them were about as big as when we planted them. We made sure that each plant was pruned back to encourage new growth this year and the trimmings were piled onto the dry hedge in the park where it will mulch down nicely. 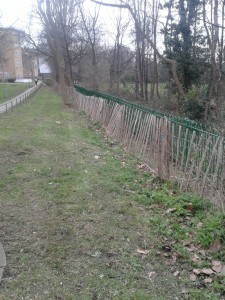 We also tidied up the chestnut fencing that had been put alongside the hedge in order to prevent accidental mowing by over excited council contractors (one of our main predators in the park!). Many of the stakes had become loose which meant that the fence was very wobbly and looked a bit of a mess. 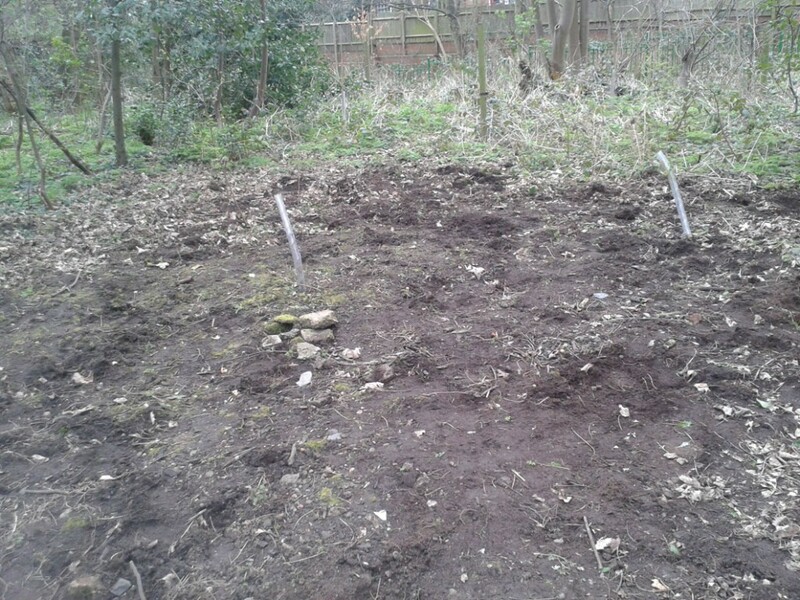 We bashed the stakes firmly back into the ground, re-tied them and even added a few extra stakes to make it look tidy again. Being Mothers Day, one volunteer had his son visiting from Derby. The poor chap had been volunteered by his dad to lend us a hand and found himself spending his Sunday morning digging cow parsley out of our new glade. Thanks Hamish! Another volunteer set about the task of picking all the litter out of the “wild” area. This section near the adventure playground borders on the Sainsburys car park and is a huge litter magnet. Sainsburys recently agreed to send their litter pickers in there but there has been no evidence of this to date and our volunteer picked 4 bin bags of rubbish plus a camping mat and an old Kodak printer. 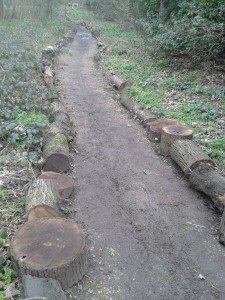 One of our most hard working volunteers, Stephen, continued with his plan to line the edges of the paths with logs. This encourages different toadstools and fungus to grow and also helps to delineate the paths in the wood, which are currently being subsumed by a layer of leaf mulch and mud. We are in need of a new layer of gravelly substrate to ensure that the wood can be navigated by the many dog walkers and shoppers that use it. We have applied for funding from the council and should hear soon if we will receive any. All in all, a great work day with a lot achieved. Many passers-by expressed their gratitude for our hard work and one gave us a packet of mints to keep us going! We even had two people sign up as members. Many thanks to all those volunteers who keep Dog Kennel Hill Wood a lovely place to visit.